Asthma is one of those illnesses that is so common that we never stop to question what causes it and how it could be treated. Affecting more than 25 million people, asthma is one of the most common chronic respiratory conditions in the United States. It is caused by the increased reactivity of the tracheobronchial tree to various stimuli, including exercise, allergies, or infections of the respiratory tract. Symptoms include, but are not limited to breathlessness, cough, wheezing, and chest tightness. The most commonly used medications for asthma are: bronchodilators, xanthine derivatives, leukotriene inhibitors, corticosteroids, and mast cell stabilizers (see full list below). Xanthine derivatives treat asthma by relaxing smooth muscle via direct action on the bronchi and pulmonary vessels. Oral corticosteroids are used for the short-term management of acute severe asthma, while inhaled corticosteroids help to prevent asthmatic attacks. Corticosteroids are also used to treat other respiratory conditions such as nasal congestion and allergic conditions such as rhinitis. 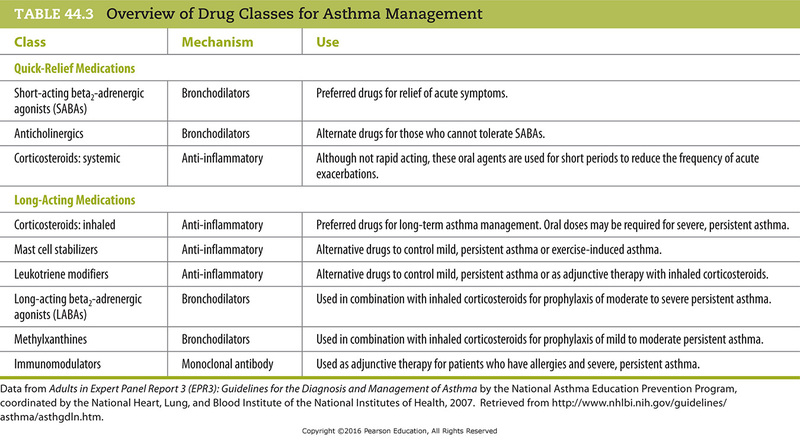 Overview of Drug Classes for Asthma Management. A list of bronchodilators can be found here. Leukotriene inhibitors block either the synthesis of leukotrienes (a metabolite of arachidonic acid), or the body's inflammatory responses to leukotrienes. Blocking receptors also block tissue inflammatory response. Thus, leukotriene inhibitors control asthmatic attacks. Lastly, mast cell stabilizers block mast cell degranulation, stabilizing the cell and thereby preventing the release of histamine and related mediators. They are contraindicated in patients with coronary artery disease, a history of arrhythmias, dyspnea, acute asthma, status asthmaticus, during pregnancy, and in children younger than the age of 6. One such example is cromolyn sodium, which should be used cautiously in patients with renal or hepatic dysfunction. 1) Asthma attacks and symptoms usually get started by specific triggers (such as viruses, allergies, gases, and air particles). You should talk to your doctor about these triggers and find ways to avoid or get rid of them. 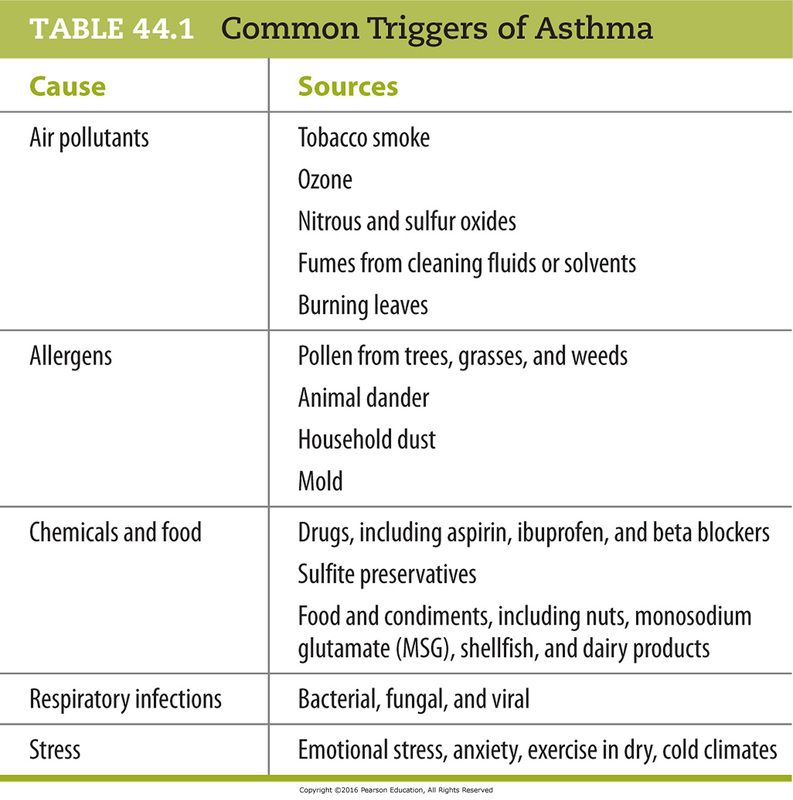 2) Asthma occurs in one in 11 children and in one in 12 adults. African Americans and Latinos have a higher risk for developing asthma than other groups. 3) Asthma cases in Americans are about 75% higher today than they were in 1980. 4) Asthma-like symptoms were first recorded about 3,500 years ago in Egypt. The first manuscript specifically written about asthma was in the year 1190, describing a condition characterized by sudden breathlessness. The treatments listed in this manuscript include chicken soup, herbs, and sexual abstinence. 5) Drugs are in development that may cure asthma and hay fever once and for all. They target leukotrienes, which are known to cause tightening of the air passages in the lungs and increase mucus productions in nasal passages.